In San Francisco, Jenny Haeg is known as the startup whisperer for commercial real estate. Whether you are a two person startup, or a multi-billion collar company, Haeg is the real estate agent most tech companies call in this city to find space that’s affordable (which is a big challenge these days). She’s been the broker behind a who’s who of new offices in tech world, including Square, Airbnb, Uber, Dropbox, Lookout, and Spotify. One challenge she’s witnessed in her dealings is that there isn’t a Houzz-like platform where startups and office managers can see pictures of other offices, and access the information of the contractors, architects and designers who created these spaces. So Haeg decided to create this for her clients. Called Custom Spaces, It’s part inspiration board, part marketplace, she explains. It features pictures of the offices of Twitter, Airbnb, GitHub, Google, Stripe and Yammer, among others. And anyone interested in finding the vendors who created these spaces can easily access this information, and contact the vendors through the site. For now, Haeg, who makes commissions off the sales/leases she brokers, explains that the site is completely free for anyone to use, and she’ll continue adding images and vendor listings gradually. While many of the companies listed have huge, spacious (and expensive) spaces, Haeg is also adding designs for the small, ten-person startup. She says designs can cost anywhere from $1,000 to millions of dollars but in the current world, there wasn’t a centralized place to find inspiration and designers that can fit any budget and size. 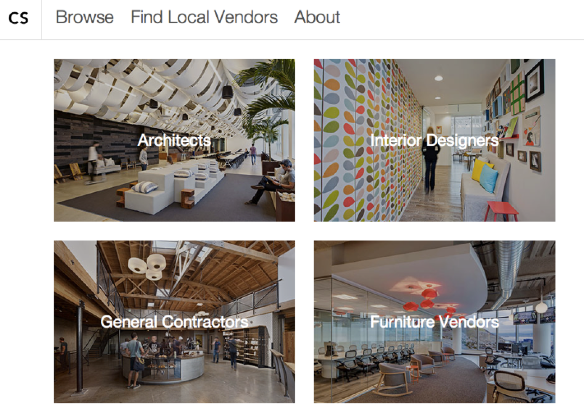 Haeg says clients are already using the site, and finding vendors through Custom Spaces. As for what she is seeing when it comes to trends in technology startups, she observes that many offices are creating open environments where there are several different workplace options. Most startups, big and small, are creating different locations within the office besides the desk or meeting room where people can work. While the Mid-Market area is becoming to go-to Mecca for companies (Twitter, Square, Zendesk etc), startups are also thinking outside the box when it comes to finding real estate. Haeg recently worked with Instacart, who wanted a house as their new office. Homes converted into commercial spaces aren’t easy to find, she explained, so she approached a seller who has listed a home in South Park for sale, and convinced the seller to rent the house instead. And the competition for space is real, she adds. There are a lot of startups looking for the 1,000-5,000 square-foot affordable space, and there are a handful of companies competing for the few 50,000 square-feet commercial spaces available in the city.